The bucket of pig’s blood is to Carrie the Musical what the chandelier is to The Phantom of the Opera — you just know both of those suckers are coming down. In fact, Carrie and Phantom have more than falling props in common. They’re both essentially horror stories adapted for the musical stage in which the central character is a misunderstood, sensitive soul who gets bullied to the point of horrific violence. The difference is that one has an upper berth on the “most successful musicals of all time” express train, and one is a flattened penny on the track underneath that train. If you’ve heard of Carrie the Musical it’s probably in the context of “musical disasters” or “Broadway’s biggest flops.” Indeed, the show began with the world-premiere pedigree of the Royal Shakespeare Company in 1988 and the spiraled into ignominy with the subsequent Broadway debut, which closed after 15 preview performances and only five actual performances. Creators Michael Gore (music), Dean Pitchford (lyrics) and Lawrence D. Cohen (book, based on his screenplay for the 1976 movie, which is in turn based on the 1974 Stephen King novel) sat tight while the musical theater world turned their show into legend that would not (unlike the title character) pass gracefully from this world. In 2009, the re-writing and re-workshopping began, and a greatly revised, scaled-down version of the show opened to mixed reviews off Broadway in March of 2012. That’s the version now heading into the world (and being done by high school musical theater groups no less). The West Coast premiere comes to us courtesy of Ray of Light Theatre, and if this production had been the one to introduce Carrie the Musical to the world, all that flop stuff would never have been allowed to lead the discussion. Rather, we’d have seen a flawed show with some arresting musical moments and two incredibly juicy roles for powerhouse women. There’s no getting over the fact that horror and musical theater is an iffy proposition at best, and depicting telekinesis on stage can’t help being slightly cheesy. Then there’s the issue of the apocalyptic prom, when poor, tortured Carrie is pushed over the edge by her entire high school full of heinous bullies and wreaks bloody revenge on them all. In the original movie (still the best in spite of a sequel, a TV remake and another upcoming remake), moments after Carrie is named homecoming queen, she is doused with pig’s blood and then everybody dies violent, fiery bloody deaths. Unless you’re going full Martin McDonagh and unleashing torrents of fake blood (which I’d love to see) and going Grand Guignol on the story, your apocalypse is going to be pretty wan. That’s definitely the case with Ray of Light. There’s an attempt to choreograph the chaos, but the result is silly rather than chilling. And there’s not even any blood. The publicity photos show the actress playing Carrie drenched in the red stuff, but director Jason Hoover chooses to douse Carrie in water while she’s bathed in intense red lights. It’s a choice, but it’s also a cop out. The one really great, highly theatrical effect during the destruction involves Kellyl Tighe’s set, and that one moment indicates there are ways to make this scene work. Horror (or lack thereof) aside, this Ray of Light production has two magnificent actors to carry the show, and that counts for a whole lot. 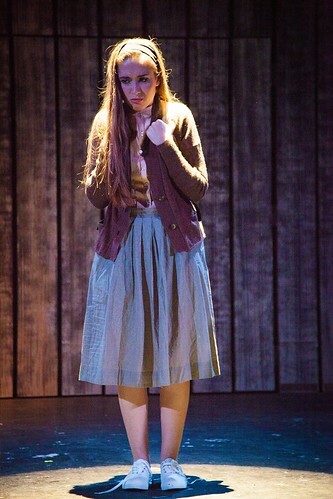 Heather Orth is Margaret White, Carrie’s religious fanatic mother, and she electrifies the stage. Her numbers “I Remember How Those Boys Could Dance” and especially “When There’s No One” underscore just how powerful the fraught story of a controlling mother and her terrorized daughter really is. And Cristina Ann Oeschger immediately makes us root for Carrie with her first song, sung with passion and a voice that soars. She comes across as believably young, and even though the path to Carrie’s empowerment is swiftly, even sketchily drawn, Oeschger does it all with such integrity that she’s irresistible. The large ensemble is energetic, and if there is some unevenness in the voices, there are some nice turns by Nikita Burshteyn as Tommy Ross, the one nice guy in the school; Courtney Merrell as Sue Snell, a popular girl who has a change a heart about Carrie; and Jessica Coker as gym teacher Miss Gardner. The Pitchford/Gore score has its appealing pop moments, but the serious musical theater is reserved for the scenes of Carrie and her mother. Act 2 loses focus, especially around the character of Carrie. For instance, we don’t need a sappy love duet between Sue and Tommy, but we do need a memorable, soul-stirring musical finale for Carrie and her mom, but we don’t get one. Instead, there’s a rush to the end that squanders all the emotional investment we have in Carrie and her mother. The show needs to go full-on blood opera at the end, but it pulls those punches. Cohen incorporates a narrative device that has Sue being questioned by the police about events leading up to the blood-bath prom, and it’s about as clumsy and ineffective as such devices can be. Still, there’s a reason this story keeps getting told and re-told. The bullying aspect certainly resonates powerfully these days, but it all comes down to the sense of being an outsider and that delicious revenge fantasy of teaching a lesson to anyone who has ever attempted to make you feel “less than.” Carrie does that in an extreme way, and in this version, she sings while she’s doing it. Entertaining and at times inspired, Ray of Light Theatre makes a strong case for problematic show. Carrie the Musical is a long way from the disaster it once was, but it’s still a ways away from the triumph it might someday be. 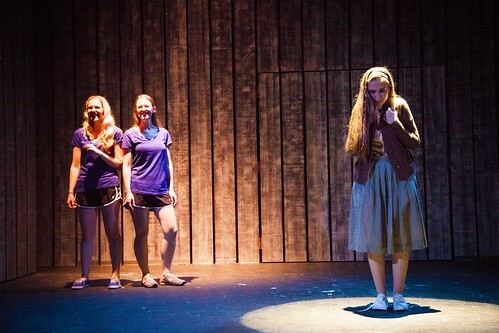 Ray of Light Theatre’s Carrie the Musical continues through Nov. 2 at the Victoria Theatre, 2961 16th St., San Francisco. tickets are $25-$36. Visit www.rayoflighttheatre.com. I saw this and you are right on. That Christina Ann is a little powerhouse and Heather Orth scared me almost as much as Piper Laurie did! Thanks for the insight. I agree with all the points you made in your review. When I think of the story of “Carrie”, I think of her drenched in blood. Actually, I should have known what was coming when Billy and Chris mimed smearing blood on each other’s cheek. But, the performances of the Orth and Oeschger are so fantastic, that all the quibbles I have become less important. Nice touch paying homage to previous incarnations of “Carrie” with the Championship banners in the gym scene. Although I don’t know what the year 2000 means.